With the return of Todd Gurley to the Georgia lineup, the Gators will miss Dominique Easley even more / Gator Country photo by David Bowie. The task of stopping Georgia’s offense just became a bit more daunting as tailback Todd Gurley had an impressive practice Monday and wide receiver Michael Bennett (arthroscopic surgery on his knee) was at practice running full speed without a knee brace. Getting both of them back would be a serious boost for Georgia but the one that has to concern Florida coach Will Muschamp the most is Gurley, who had 450 yards rushing and an 8.7 per carry average in the games he played. Florida has the corners to handle Bennett, but can Will Muschamp devise a scheme to plug the holes in his defensive line to stop Gurley? The Gators have given up 380 rushing yards in their last two games, most of it between the tackles where the 220-pound Gurley does most of his damage. Without Dominique Easley to occupy the gaps on either side of the center, there has been very little in the way of penetration from Leon Orr, Damien Jacobs, Jonathan Bullard or Darious Cummings. Since he doesn’t have the athletes, Muschamp is going to have to do it smoke and mirrors with his scheme. Losing to Georgia never settled well with Steve Spurrier, which is why he spent an entire year plotting revenge for what happened in 1997 when the Gators dropped a 37-17 decision, the only time Spurrier lost to Georgia as Florida’s head coach. 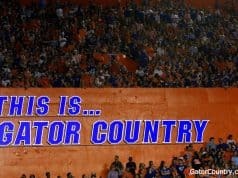 Both the Gators and Poodles came into the game with identical 6-1 records with the losses coming at the hands of eventual national champ Tennessee. 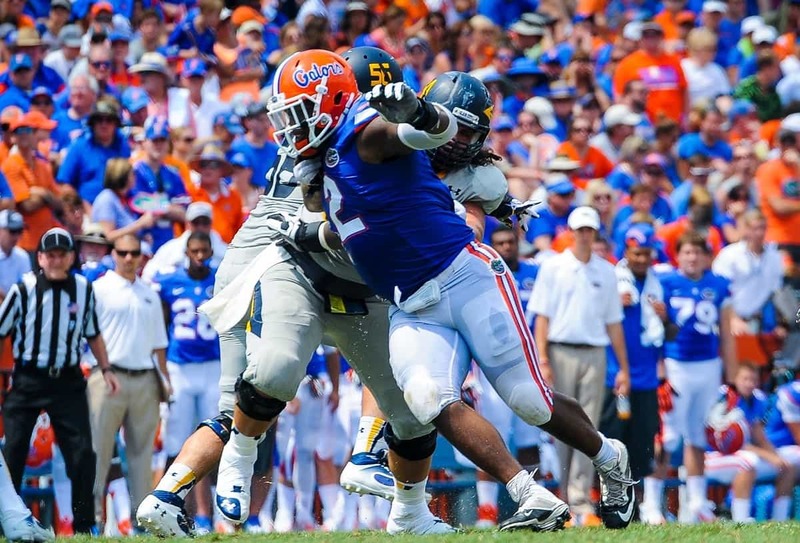 The Gators scored on their first three possessions of the game – touchdown passes from Doug Johnson to Travis Taylor and Darrell Jackson and a two-yard Johnson run – and never looked back. With a 24-7 lead midway through the fourth quarter, Spurrier sealed the game with a double-reverse pass for a touchdown that went from John Capel to Travis McGriff to Johnson for the TD. When the Gators recovered a Georgia fumble with about 40 seconds left, Jim Donnan sent in his first team defense to try to keep Florida from scoring. Spurrier countered by going five wide and giving the ball to John Capel for an eight-yard end around for a touchdown and the final nail in a 38-7 coffin. Devin Robinson (6-8, 190, Chesterfield, VA Christchurch School) will be making his decision about where he will be playing college basketball on Thursday night. He is a combo forward who is as comfortable at the wing as he is on the high post and is considered a three-position defender. 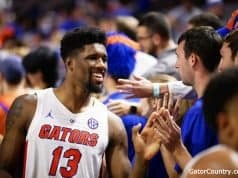 Robinson visited Florida two weekends ago, at which time the Gators were thought to be trailing both Indiana and Oklahoma State. 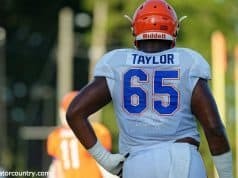 But, with Indiana taking a commitment from Max Hoetzel (6-7, 210, Calbas, CA/Wilbraham, MA Wilbraham and Monson Academy) and Oklahoma State taking one from Joe Burton (6-6, 195, Humble, TX Atascocita), the Gators find themselves in excellent position to land their third scholarship commitment for 2014 – the others are point guard Chris Chiozza (5-11, 160, Memphis, TN White Station) and Brandone Francis (6-5, 210, Jacksonville, FL Arlington Country Day). It is expected that Robinson’s final decision will be between Florida and Oklahoma State. Former Gator All-American Mike Pouncey was served a subpoena to appear before a grand jury by the Massachusetts State Police after the Miami Dolphins lost to the New England Patriots in Foxboro Sunday afternoon. Although Pouncey is not thought to be in any trouble he might be a material witness in the mounting case against Aaron Hernandez, who roomed with the Pouncey twins in Gainesville in 2007-08. Hernandez is charged with one murder in Massachusetts and is suspect in two others, plus he might have been involved in interstate gun trafficking. Authorities want to see Pouncey’s bank records and his computer hard drive to check emails with Hernandez. Right now the smartest thing Mike Pouncey can do is cooperate fully to ensure there are no ties to any wrong doing. This is no time to be loyal to anyone but himself. Miami (7-0) is ranked seventh and unbeaten at this juncture of the season for the first time since 2003, which also happens to be the last time the Hurricanes and Florida State met when both teams were unbeaten. You would think that with FSU (7-0) ranked third that it would kindle some seems like old times storylines except that Miami is getting absolutely zero in the way of respect. The Hurricanes head to Tallahassee Saturday as 21-point road dogs in what looks like the toughest game the Seminoles have remaining on their schedule. It almost goes without saying that Miami coach Al Golden will spend the week preaching “no respect” to his team to motivate them to play their best game of the season. Florida State coach Jimbo Fisher believes the unbeaten and third-ranked Seminoles are as good as any team in the country, but when it came time to vote in the USAToday Coaches Poll, Fisher voted the Seminoles third behind #1 Alabama and #2 Oregon. Fisher told the Associated Press that Alabama, which is looking for a three-peat, has “done it and earned it for two years.” Fisher, who refused to run up the score on North Carolina State Saturday after rolling to a 42-0 lead at the half, said he won’t coach for the polls. “If they can’t tell we dominated that game early and put it away — I just think that’s bad for college football, in my opinion,” Fisher said. Arkansas coach Brett Bielman, who has been feuding with the Auburn coaching staff since the summer, just threw another can of gasoline on that fire, claiming that the some plays on the scout tape that Auburn sent doesn’t match the television tape that Arkansas has of Auburn’s offense. In the SEC, teams are required to exchange tape footage for scouting purposes and there is an unwritten rule that the tapes are never doctored up, which is what Bielma is claiming. The SEC office, according to Al.com sources says there are no discrepancies. Perhaps Bielma is trying to take the attention away from the five-game losing streak in which his team is mired. Auburn (7-1, 3-1 SEC East) is ranked 11th nationally and favored by 11.5 points over Arkansas. In the past 24 hours I’ve heard: the first call at Texas will go to Nick Saban, the second to Art Briles (Baylor) and the third to Al Golden (Miami). Of those three, I think Golden would be the candidate to move. He’s only making $1.75 million at Miami … I have heard that there is mutual interest between Southern Cal and Texas A&M coach Kevin Sumlin. Sumlin is viewed as a home run hire for Pat Haden, while USC alum/Broncos defensive coordinator Jack Del Rio does nothing to inspire the masses. I’m also told that it’s likely Haden’s short list will include former Stanford/now Colts OC Pep Hamilton, James Franklin of Vandy and Golden … Odds are good that Dana Holgerson will lose his job at West Virginia and Bo Pelini will be gone at Nebraska. I expect West Virginia will go hard after Clemson offensive coordinator Chad Morris. I hear that Nebraska will make a play for former Husker defensive back and North Dakota State coach Craig Bohl, who is going for his third D1AA national title this year. I have never been one you could classify as a “Deadhead” but I’ve always enjoyed the music of the Grateful Dead ever since I saw them live in Durham back in 1973 at Cameron Indoor Stadium at Duke University. About three months later in Greensboro, I got into a locker room discussion about the Dead with their greatest fan ever, Bill Walton, at the Greensboro Coliseum the day before UCLA played North Carolina State in what ranks as the best NCAA semifinal game I’ve ever seen. I’ve always liked that Dead concerts included a solid mix of their own music and OPM (other people’s music), everything from Bob Dylan to Stevie Winwood to Merle Haggard. I had a tough time deciding between their version of the Dylan classic “The Memphis Blues Again” and a Dead original, “Birdsong.” Birdsong won because I found this very nice acoustic version. Franz Beard………..always great articles……great insight, great content…..I look forward to reading your “stuff” every day……..Thanks. Now about your thoughts on music???? Whatever happened to Johnny Cash, Willie nelson, Merle Haggard and the boys ?? At least 90% od your readers (listeners) are rednecks and never heard of some of your people. Keep up your great writings.